THE widow of the cook who disappeared aboard the Sage Sagittarius coal ship in 2012 has dismissed any talk that her husband might have taken his own life. Filipino chief cook Cesar Llanto vanished aboard the Sagittarius on August 30, 2012. Nelia Llanto is appearing from Manila via a courtroom video feed, her evidence converted from Tagalog into English by an in-court translator. Counsel Assisting Philip Strickland asked Mrs Llanto whether she thought her husband took his own life aboard the Sage Sagittarius. "No sir I don't believe that," she said. "His last job on the Sage Sagittarius, he went there voluntarily. He was not forced," she said. "He told me that once he returned from that trip, we would buy a second-hand car. "He loved us very much. "He was looking towards his return." The Llantos have two children, Czar, now 14 and Czarina, now 12. Two weeks after her husband disappeared, an engineer named Hector Collado would fall 11m to his death as the ship arrived at the Port of Newcastle on September 14. Mr Strickland told the inquest both deaths "are highly suspicious". FEATURE: The murky waters surrounding the "Death Ship"
JUST days before a Filipino injured fell 11m to his death, MV Sage Sagittarius engineer Hector Collado rang his wife with a warning. Mr Collado was the second of three men to be killed on the Sagittarius in late 2012. His death came two weeks after the ship's chief cook Cesar Llanto mysteriously disappeared as it cruised south off the Queensland coast. An inquest into three deaths aboard the merchant ship began on Thursday morning. Counsel assisting Philip Strickland told the court Mr Collado rang his wife Rebecca in the Philippines three days before his death. The court heard he asked his wife not to bring the children when she collected him from the airport. The Collados have grown-up children Victor and Ronald and grandchildren. The court heard the engineer rang his brother Ronald to ask him to ensure multiple cars were used when picking him up from the airport. No one was to know which car would taken them home, he said. It later heard Mrs Collado spoke with the ship's captain Venancio Salas Jr at her husband's funeral. He told her how he suspected her husband had suffered a mental breakdown after the earlier death. She now "expressed such fear of these investigations and this inquest" Mr Strickland said, that she had disconnected her landline phone. Nelia Llanto, the wife of the cook who vanished, has begun giving evidence via video feed. AN INQUEST into how two men died aboard the Sage Sagittarius merchant ship may be linked by a shared connection to a gay kitchenhand who was the alleged target of bullying on board. The New South Wales Coroner's Court is holding the first two days of the inquest into how two Filipino ship-workers Cesar Llanto and Hector Collado died aboard the Sage Sagittarius - dubbed the death ship - as it travelled through Australian waters in late 2012. The court heard kitchenhand Jessie Martinez had been allegedly brutalised by the ship's captain Venancio Salas Jr. It heard Mr Martinez told Australian Federal Police he was struck four times by the captain. One instance, he told the AFP, involved a strike to his kidney which left him struggling to breathe for days. Counsel assisting Philip Strickland said there had been some tension aboard the ship when Cesar Llanto vanished, with Mr Llanto playing some role in advising Mr Martinez on how to deal with the apparently intimidating conditions on board. Another crew member named Raul Vercede instructed Mr Martinez to formally report the ship's captain to the International Transport Worker's Federation in Australia. Conflicting accounts suggest either Mr Llanto was fiercely against the plan, or would later weaken and support it. The court also heard the first suggestion that Mr Collado's death involved more than simply a fall from a great height. Mr Strickland told the court that forensic experts found a 20mm cut to his skull that could not be explained. He said there is so far no clear evidence "clearly implicating any single person or group of people in the deaths". Nelia Llanto, the widow of the lost engineer, is expected to appear at the inquest today. The ship's captain is scheduled to give evidence on Friday. THE wife of one of the three killed aboard the so-called "death ship" in Australian waters is expected to take the stand as the inquest into the fatalities begins this morning in Sydney. Nelia Llanto is the wife of chief cook Cesar Llanto, a Filipino seafarer who disappeared from the Sage Sagittarius ship as it headed south off the Queensland coast in 2012. He was the first of what would become a spate of deaths on board. Two weeks after his death, chief engineer Hector Collado would fall 11m to his death as the ship arrived at the Port of Newcastle. Australian authorities consider both deaths suspicious. A third man would die when the ship returned to Japan, crushed to death by conveyor belt machinery as the ship was unloading. Forensic pathologist Dr Brian Beer is also expected to give evidence to the inquest on Thursday. Ship captain Venancio Salas Jr is scheduled to speak to the inquest on Friday. The inquest was ordered following an in-depth investigation into the circumstances surrounding the fatalities by Australian Regional Media, which publishes this website. 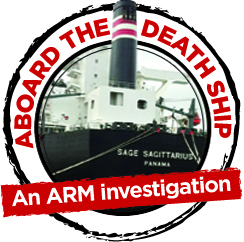 Ahead of proceedings, International Transport Workers' Federation coordinator Dean Summers said he suspected "foul play" aboard the Sage Sagittarius since the first death was confirmed. Mr Summers said the ITF - which advocates for the rights of seamen - became involved after hearing the crew was left terrified after a man vanished at sea. Each fatality and their subsequent investigations will be examined through an inquest by NSW Deputy Coroner Sharon Freund. "The first reports was the crew was terrified for their lives after a man overboard. That sounded unusual," Mr Summers said. 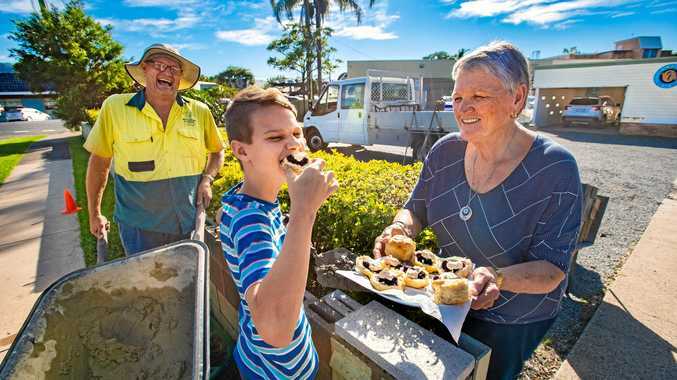 "The company responded by sending security guards out from Queensland by helicopter with some of its most senior people to go on board the ship. This is unheard of." Mr Summers and the ITF lobbied the Australian Government and Australian Federal Police to launch a proper investigation into the deaths. A third man would later die on board the ship as it returned from Australia to Japan. Safety supervisor Kosaku Monji's remains were found after his body was crushed by conveyor belt machinery. Mr Summers said all three men were senior, experienced workers who lead teams of other sailors. "(Kosasku) Monji was responsible for a fleet of ships. So what was he doing working on the rollers at 4am in Japan? "The deaths of men or people at sea deserve at least some level of investigation or scrutiny."